Google unveiled Tuesday an artificial intelligence tool capable of handling routine tasks — such as making restaurant bookings — as a way to help people disconnect from their smartphone screens. Kicking off the tech giant’s annual developers conference, Google chief executive Sundar Pichai argued that its AI-powered digital assistant had the potential to free people from everyday chores. Pichai played a recording of the Google Assistant independently calling a hair salon and a restaurant to make bookings — interacting with staff who evidently didn’t realize they were dealing with artificial intelligence software, rather than a real customer. Tell the Google Assistant to book a table for four at 6:00 pm, it tends to the phone call in a human-sounding voice complete with “ums” and “likes,” and sends you a message with the details. “Our vision for our assistant is to help you get things done,” Pichai told the conference in Google’s hometown of Mountain View, California. Google will be testing the digital assistant improvement in the months ahead. “Many of us feel tethered to our phones and worry about what we’ll miss if we’re not connected. We want to help people find the right balance and gain a sense of digital wellbeing,” Pichai said. “It’s clear that technology can be a positive force and improve the quality of life for billions of people around the world.” Pichai said. Much of the focus was on Google Assistant, the artificial intelligence application competing against Amazon’s Alexa and others. “It uses artificial intelligence to bring forward the best of human intelligence – great reporting done by journalists around the globe – and will help you stay on top of what’s important to you,” Pichai said of overhauled Google News. And, evidently popping news ‘bubbles’ created by tailoring results to what people want to hear, everyone will be shown the same content on topics, according to product and engineering lead Trystan Upstill. Google Assistant is also being taught to better understand people and interact with them more naturally — and will be getting new voices, including one based on the voice of singer John Legend, as well as programming to improve conversation performance. 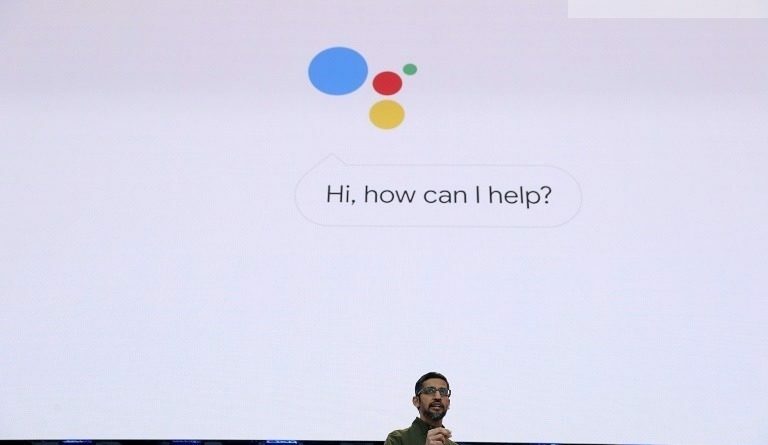 “Thanks to our progress in language understanding, you’ll soon be able to have a natural back-and-forth conversation with the Google Assistant without repeating ‘Hey Google’ for each follow-up request,” Pichai said. In another effort to untether people from smartphone screens, a dashboard breaks down time spent on devices and how often they are unlocked. Google also planned to add a “shush” mode to its Android mobile software, switching smartphones to a do-not-disturb mode when they are placed face down on a table. YouTube watchers will be able to set a pop-up message to remind them to take breaks from viewing, according to Pichai. “This is going to be a deep, ongoing effort across all our platforms,” Pichai said. Google is seeking to make services more personal, relevant and intimate from maps to email, Gartner analyst Brian Blau told AFP after the keynote presentation. “The are taking a very human approach to technology, and convincing you people can continue to rely on Google,” Blau said.